I will be the first to admit to you that I am not that great at cooking or baking. Sometimes I get myself in this train of thought that I actually am good, and then I fail miserably. 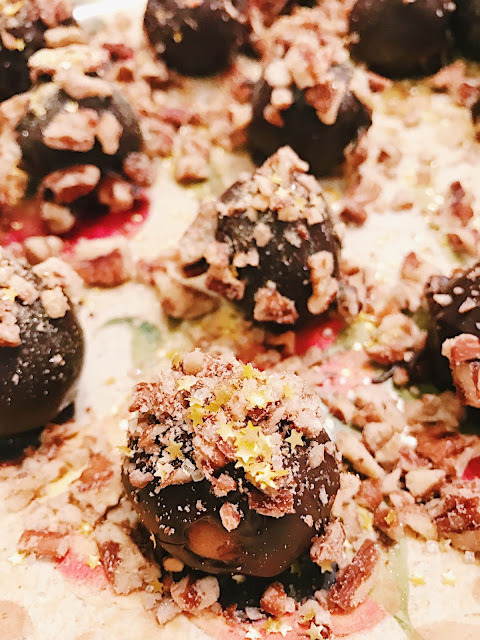 Luckily, come Christmas time, I am surrounded by very gifted cooks who gift me with delicious cookies and treats so I don't have to go through the torture and pain of burning all of my cookies or the frosting not coming out how I want it to. My Mom and I, however, are all about chocolate covered pretzel rods. They're crazy easy to make and leave the door wide open for combinations! And they're actually pretty fun to make. At least I think so. My Mom generally does the dipping and I put the flourish on there with our toppings. 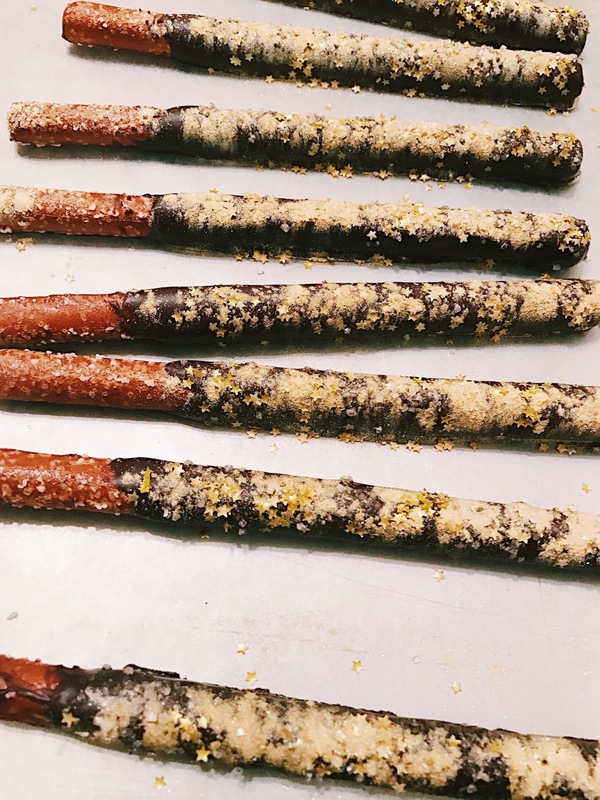 We grab two bins of pretzel rods and then do one batch covered in dark chocolate, one batch in milk chocolate with white chocolate drizzle, and one batch of white chocolate. Then the toppings are up to us! 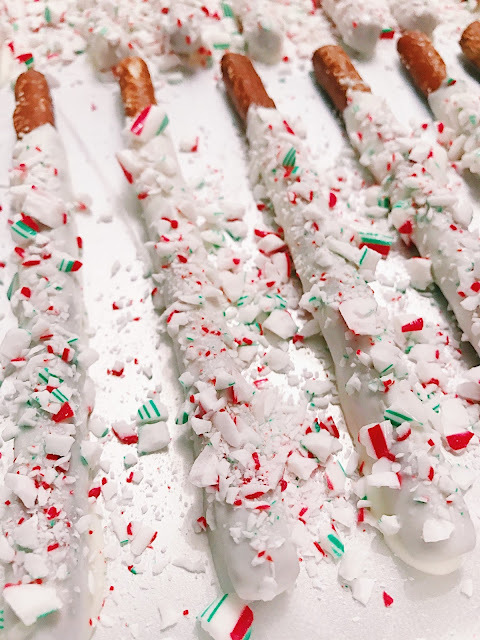 The white chocolate with the candy canes is pretty much a staple for us. They look so pretty and are obviously quite festive. Usually we go with rainbow sprinkles for the sprinkle selection, but we decided to be a little more festive this year with green and red sprinkles. We even threw in some white/clear ones to look like snow but used those sparingly. These are usually a big hit since most people like milk chocolate the most of the three. And then there are my personal favorites: the dark chocolate ones. I'd been wanting to do something with luster dust and I thought this would be a good project. Plus I found these stars when I was at Michael's and they just felt too magical not to get! These are so delicious and quite pretty. I love how they turned out! We put one of each in a little treat bag and make it a perfect gift, or you can just take a bunch over to someone's house on Christmas day. They're easy to munch on and something that pretty much everyone likes. My Mom also found this recipe for Turtle Cookie Balls that we decided to give a try. They were quite easy to make and are pretty yummy! We had some luster dust and stars laying around so I decided to throw them on top to give them a little extra flourish. You have to work quick with these as they settle up quickly, but they're easy to make and quite delicious! 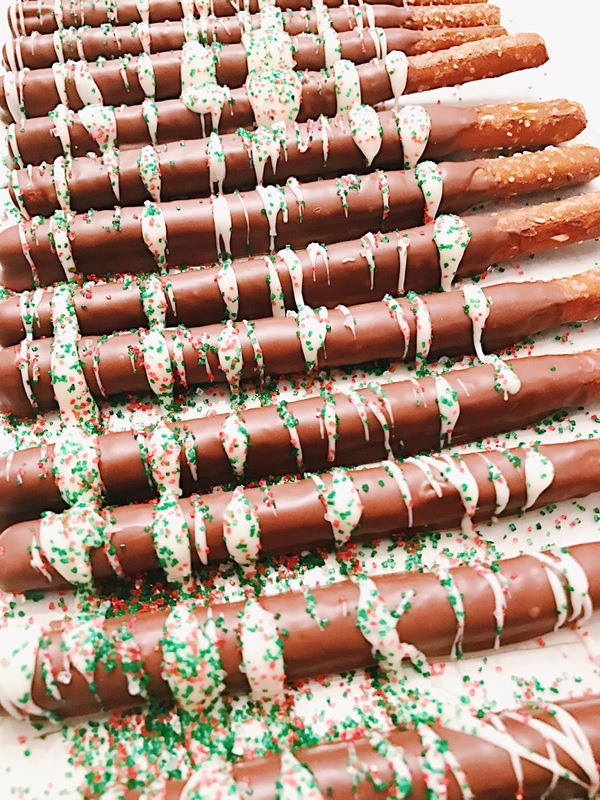 What are some of your go-to treats to make around the holidays?